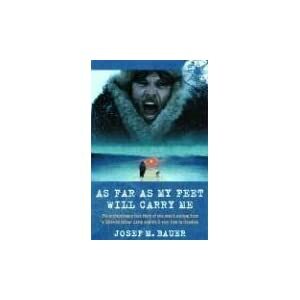 Title: "As Far As My Feet Will Carry Me"
Comments: A wonderful example of a gritted determination to overcome what were almost impossible odds. A rivetting book that was hard to put down! "Clemens Forell", for that was the name that the main character in the story was given (apparantly to avoid detection by Soviet agents after his return to Germany), gives a good expose of the terrible conditions that German POWs were forced to endure long after the war ended. The decision to escape made due to the almost certain inevitability of death if one chose to remain a prisoner and accept the prevailing inhumane conditions. His "meandering" along the way I found strange and would have appreciated more detailed explanations as to why he stayed at certain places for as long as he did and not "get a move on" and so get home as soon as possible. Another aspect I felt strange was the fact that, when reviewing him as a person after he finally does return to Germany, he doesn't come over as a particularly "nice guy". It doesn't detract from the enjoyment in knowing that he did finally get back to Germany. Sadly, so many others didn't.